Know all about Aadhaar TOTP. Do you want to know how to generate TOTP for your Aadhaar card? In this tutorial, you will know what is TOTP and how to generate TOTP in Aadhar within a minute. It’s very simple and easy to generate TOTP. So Let’s move on without wasting more time. Where to use Aadhar TOTP? TOTP is a One Time Temporary Password that is generated by an Algorithm. It is only valid for 30 seconds and then it automatically gets expire. Due to its validity, it is called TOTP, which is called Time-Based OTP. TOTP is 8 digits long numeric string. It is generated separately for every Aadhaar card holder in for 30 Seconds. With time-based OTP, the TOTP validation server and token generation app like mAadhaar use their respective system times to generate OTPs. The TOTP algorithm assumes that the system times are synchronized. #1. The biggest problem of SMS-based OTP is that we have to rely on our mobile network for that. #2. Due to Aadhaar TOTP, we do not have to face the problems of SMS-based OTP.TOTPs avoid a number of shortcomings that are associated with traditional SMS based OTP. #3. Sometimes, even if we have a network in Mobile, our Registered Mobile Number does not come with an OTP. Generating and sending OTP requires users to go through a completely unrelated workflow which is very much confusing. The mAadhaar application is the TOTP generator, from here you can generate TOTP easily for Aadhaar card. #1. Download Aadhar card or update any kind of information in it. #2. To check Aadhaar status and download Masked Aadhar card and Aadhar virtual ID (VID). Aadhaar TOTP is only generatable in a mobile application mAadhaar. 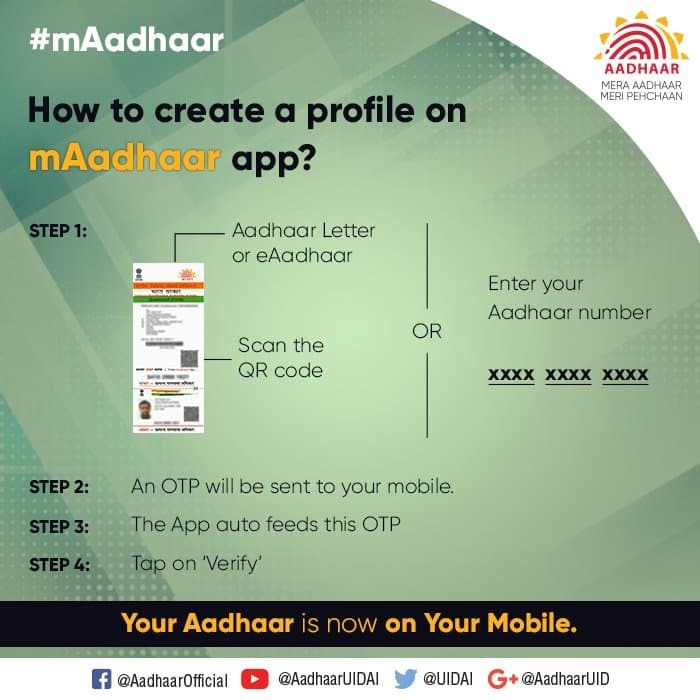 You first need to download the m-Aadhaar app from your Google Play store on your Smartphone. After that, you can Generate Aadhaar TOTP through the m-Aadhaar App. 1. 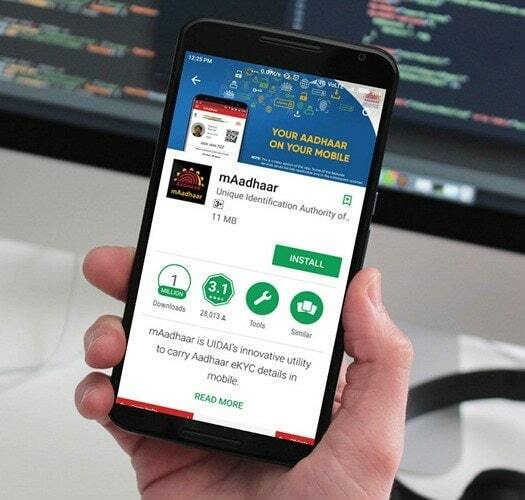 Download the mAadhaar app from play store. 2. Create your profile on mAadhaar. Note: Ensure that the device you use to install mAadhaar has the SIM of your Aadhaar registered mobile number. 3. 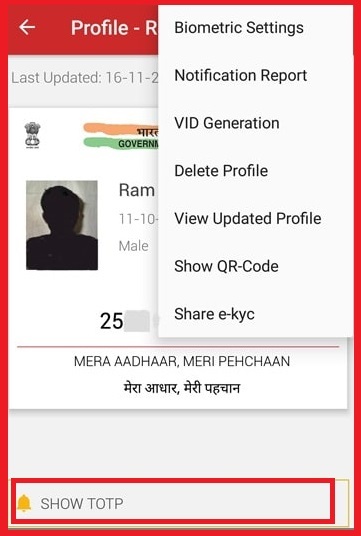 After making your profile on mAadhaar, you will able to see your Aadhaar card on mobile and enjoy many Aadhar services like Lock/Unlock Biometrics, VID Generation etc. 4. Click on Show TOTP at the bottom of the screen for generation of Aadhar TOTP. 5. Then you will see a unique 8 digit code. 6. You can use that code(TOTP) instead of OTP. NOTE: The TOTP in Aadhar will expire within 30 sec from the time it is generated. If you came across a problem, You could raise your question in the comment box below.